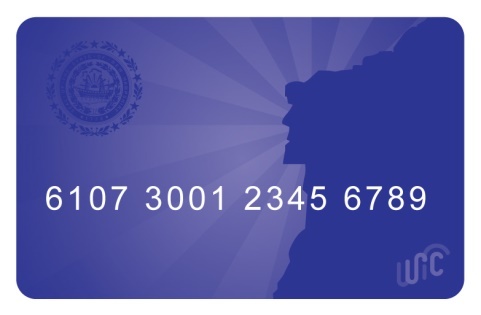 Concord, NH – The New Hampshire Department of Health and Human Services’ Division of Public Health Services now offers state-wide use of Electronic Benefits Transfer (EBT) for the Women, Infants & Children’s Nutrition Program. WIC provides nutrition education and nutritious foods to help keep pregnant women, new mothers, infants and preschool children healthy and strong. The new eWIC card makes this federal nutritional service a more positive experience for both retailers and families. In July, New Hampshire piloted the new eWIC card in Strafford and Carroll Counties. After successful fulfillment of the 90-day pilot period, rollout was completed in Belknap, Cheshire, Coos, Grafton, Hillsborough, Merrimack, Rockingham and Sullivan Counties last week. The updated WIC benefit delivery system enables clients to use a WIC card, similar to a debit card, making it a faster, easier and more secure transaction process. With the card, families are able to purchase food as needed and not all at once, as was the process with the former paper voucher. The new EBT delivery also provides a more private and discreet transaction for WIC families. WIC clinics provide nutrition and breastfeeding education and support, healthy foods and referrals to healthcare and social services through one on one and group appointments. Clinics are available throughout the state to serve families, especially pregnant women, new mothers, infants and preschool children. To qualify for WIC, a family must be income eligible, reside in New Hampshire and be one of the categories served; pregnant, postpartum, breastfeeding or children under age five. Families with a low to medium income and those who are part of other programs such as foster care, NH Medicaid, SNAP or TANF are automatically eligible. Making services more customer friendly and reducing the stigma through eWIC cards enables families the tools to maintain a healthy and balanced diet during a critical time of child development and growth. More information and a pre-screening tool for the Women, Infants & Children Nutrition Program can be found on the DHHS website at www.dhhs.nh.gov/dphs/nhp/wic/. Contact information for clinics throughout the state can be found athttp://www.signupwic.com/.